You can spend a lot of money on a weed trimmer and an edger, but there is no reason to waste money unnecessarily when you can get one tool that does both jobs. This trimmer easily converts to a wheeled edger. It is designed to trim overgrowth after you mow, and it is great for taking care of edging along borders, flower beds, and even sidewalks. It won’t be long before you have the neatest yard on the block once you start using the LSTE525. Increased Torque – The PowerDrive Transmission gives you plenty of torque, so you have loads of cutting power. You can easily cut through some of the toughest weeds and vines in short order, so you can have more time to do other things besides working on your yard. More Power/Running Time – This tool has a two-speed control that allows you to decide if you want to have increased power or more running time. Each battery lets you have a full hour of run time, so you should have more than enough time to get your entire yard done, even if your yard is a large one. ​Trimmer to Wheeled Edger – It is easy to convert this tool from a trimmer to a wheeled edger. It just takes a couple of seconds to make the conversion, and you don’t have to bother with a lot of buttons. Simply press one button to switch from one tool to the other and back. ​Comfortable to Use – A lot of trimmers are bulky and awkward, and not at all comfortable to use. This is not the case with the LSTE525. Not only does it have a micro-texture soft grip for comfort while holding onto it, the height is adjustable, so it is ideal for anyone, no matter what their height or arm span is. ​Batteries – Having two batteries is great, because you get a lot more run time. This unit comes with two lithium-ion batteries, and you can get up to 33 percent more run time compared to battery packs for other trimmers from this company. The runtime extension feature lets you get the same speed and performance, no matter what the grass conditions are. No Gas – If you don’t like the idea of using a gas trimmer that gives off emissions that are harmful to the environment, a battery powered trimmer such as this one is a great option for you to consider. It has all the power that you would get with a gas trimmer, but you don’t have to worry about it leaving a carbon footprint. So, we have talked about the great features of the Black & Decker LSTE525, but this isn’t to say that there are no issues that customers have complained about. Every product, no matter how great it is, has its little quirks, and this one is no exception. So, have a look at both the good and bad things that people are saying about this trimmer/edger. Less Body Strain – The comfort grip and adjustability of this trimmer/edger make it a lot easier to handle than other comparable models. Because it is more comfortable to use, you won’t find yourself getting nearly as much back, neck, shoulder, and arm strain that you may have had in the past when using other trimmers. Ease of Use – When you want to convert this tool from a trimmer to an edger, you don’t even have to stop what you are doing. Just press a button and keep on working. It is easy to adjust the handle to a height that is perfect for you, and you won’t have any problems reaching tight areas, or even up high to get at the top of your hedges. Cut a Wide Path – This trimmer/edger lets you cut a path that is 12 inches wide. This means that you are going to get a lot done in a short period of time. It is the ideal tool for creating paths and walkways in your yard, and you can get it done in a single sweep. Batteries – The batteries for this unit are interchangeable with other Black and Decker products. This tool can use up to a 7.5 amp hour battery. If you have other B&D products, you can save a lot of money because you don’t have to buy extra batteries. Cleaning – Many trimmers can be hosed down when you need to clean them. There is more work involved with this unit, because you can’t use water on it. The instructions say to not get the motor wet. You can only clean it with a damp cloth. 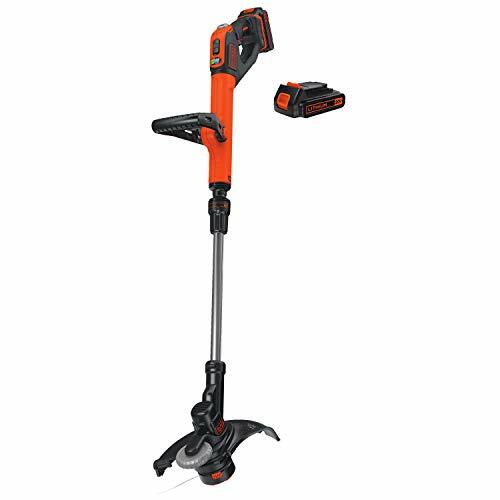 Rather than wasting money on two lawn and garden tools, not to mention having to find space for two tools, you might want to consider getting the Black & Decker LSTE525.It is two tools in one, so you get the best of both worlds for the price of one tool.